Order Summary: This field displays your order information (quantity, price, product, month/year, and algo name). These pre-set quantity buttons increase the Quantity field by their numeric value. The quantity defaults are 1, 5, 10, 100, and 500. Refer to Customizing the Quantity Buttons. The Clear button deletes numbers from the Quantity field. To clear the entire pane, click the Reset button. Note: Depending on the algo selected, this field may be disabled. Right-click to increase the value. Left-click to decrease the value. Click the up and down arrows. Manually type a value using the keyboard. Multiple an existing order quantity by 1000 by pressing the * (asterisk) on the keyboard. Note: Depending on the algo selected, these fields may be disabled. Click to start the algo. Click to set the Buy/Sell variable and start the algo. Note: The Buy and Sell buttons only appear when the algo has a Buy/Sell variable. Customer Selection List: This field lists the customer profile for which the SEL box is selected in the Customer Defaults window. Note: You can immediately trade with the <Default> profile as long as you set up an account in its row. Clears all price, quantity, and order data without starting the algo. Opens the Routing Rules dialog box. Note: The Routing Rules dialog can also be launched by clicking a link in the routing preview pane. 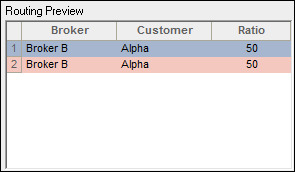 Allows you to select an order gateway (non X_TRADER ASP) or broker (X_TRADER ASP) to associate with the order. Upon selection a list of available customers will appear to the right. 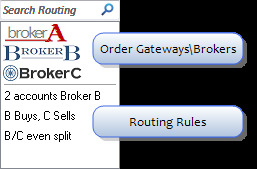 A gray line separates the order gateways or brokers from the routing rules. These are the routing rules that were defined within the Routing Rules Configuration dialog box. List of available customers for the selected order gateway (non X_TRADER ASP) or broker (X_TRADER ASP) as defined within Customer Defaults. Contains editable account information that is defined within Customer Defaults. Account: Indicates the customer account number. 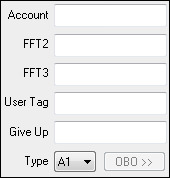 FFT2: Used for annotation purposes, up to 15 characters in length and can include special characters. FFT3: Used for annotation purposes, up to 15 characters in length and can include special characters. User Tag: Used for customer reference throughout X_TRADER. Give Up: Indicates the clearing member code. Used for Give-up trade accounts only. Type: Indicates the account type. 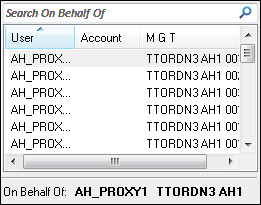 This field appears when a selected broker has multiple order gateways available. When a Routing Rule is selected a preview of the selected rule displays. Colorless indicates a buy or sell. Direct Traders have the ability to enter orders on behalf of customers who's TTORD's are mapped to the Direct Trader's M and G.Click the OBO button to display a list of TTOR ID's that have been mapped to your ID. Note: Access to this functionality is controlled within TTUS. When the OBO is clicked a list of available TTORD's that have been mapped to your ID appear. Selecting an OBO allows you to submit an order on behalf of the selected TTORID. See On Behalf Of Orders for additional information. Indicates the algo selected. Algos are displayed in alphabetical order beneath each Algo SE server. Warning! 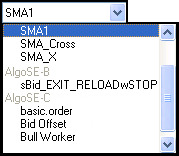 Check the settings on the other Order pane columns before you start the algo. Collapses the other Order pane columns. Name of the algo instance. This will default to the name that was defined in ADL® (Algo Design Lab). Defines the action taken on a working algo upon connection loss with the Algo SE server without an orderly shutdown. Leave: Leaves the algo order working. Pause: Stops further actions of the algo order. Delete: Deletes the algo order. Displays a short description of the algo. Displays the algo variables. These vary for each algo. Variable: Displays the variable name that was defined in ADL® (Algo Design Lab). Value: Displays the default values for each variable as defined in ADL® (Algo Design Lab).